After much careful consideration I've decided to sell my S3. I've owned it from new since April and it's truly a thing of beauty. It looks fantastic, sounds incredible of course, it plays perfectly and is in absolutely immaculate condition. So this S3 has all the trimmings. It's got Paramatrix EQ, Tri-Max pickups with the bridge pickup moved 10mm closer to the neck for a little more comfort and warmth. It has a slap ramp because I like the way it softens the look of the end of the fingerboard. I also had Rob make a pickup ramp shaped to fit between the pickup lugs although I haven't attached it. Woods are alder body with ash facing. The finish is gloss transparent black with a natural faux binding. I wanted sort of a black beauty vibe but with visible wood grain. 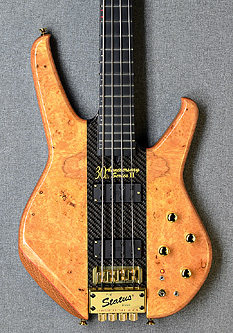 Series-3, 5-string, through-neck, fretted 24 frets, 'slap-ramp' on end of fingerboard. It cost £3775 GBP to have this bass made and again it's immaculate condition. As such I'd like to offer it for sale at £3100 GBP. All sensible offers considered. The bass is located in West London so viewings are welcome. Happy to ship anywhere in the world at the buyers expense. Collection is of course fine if you're local. Dropping asking price to £2999. Price drop to £2599. Happy Christmas to you all. Approximately would it cost to ship to the San Diego, CA USA? Sorry for the delayed response. I didn't get notified of your question. According to www.parcelforce.com it'll cost £147.75 to send it to you using their Global Priority service plus £87.75 to insure it for £2500. Dropping asking price to £2250.